Image © DC Entertainment. Written by Joshua Williamson, art by Christian Duce, colors by Ivan Plascencia, letters by Steve Wands. Barry Allen has teamed with young Wally West when in action as The Flash, having found that Wally’s speed force powers help to control his own new negative speed force powers, allowing the two of them to fight crime effectively together. When not in costume, things are awkward, as Barry and Iris West have split and are not speaking. 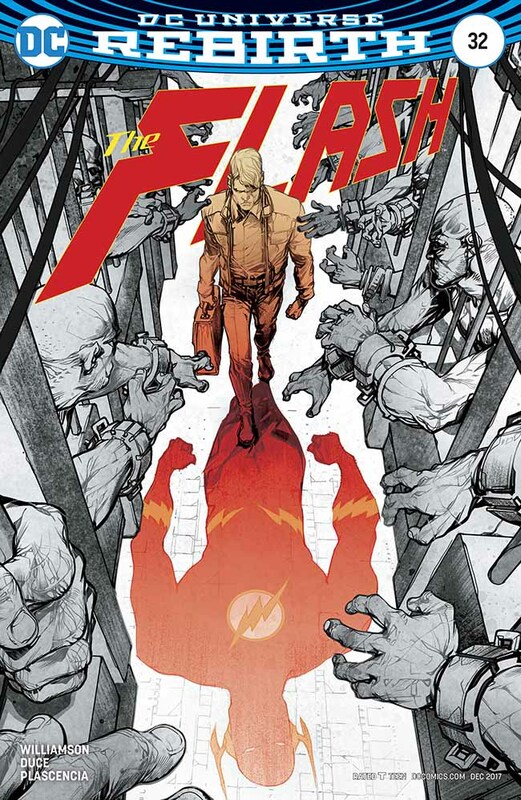 Meanwhile, Barry has to report to the maximum security prison in Central City harbor, Iron Heights, where he and his crime lab partner Kristen have been assigned to work. Kristen feels she’s been sent there unfairly, and is not happy with Barry either. Inside the prison are many of the costumed criminals The Flash put there, making his position all the more precarious. Once in the prison, Warden Wolfe makes it clear he has little time for the crime lab staff, and little interest in their concerns about the harsh way he is running the prison. Outside of Central City, a mysterious new crime lord has been encroaching on the territory of existing crime lord Copperhead, and she’s trying to find him by torturing one of the rival’s men with her venemous snakes. On the final page we have the return of another speedster not seen for a while. The change of scene and company for Barry Allen makes for interesting reading. Recommended. This entry was posted in Comics, Reviews on March 26, 2018 by Todd. Haven’t read this title since The Button, sounds like I should give it another try.